Does Cosmetic Express Really Work? For the most part women like to be organized, but there are just some things like makeup for example that really can be a challenge to keep neat and orderly. There may be a solution though where being organized for these items really isn’t necessary. Is the Cosmetic Express an item that can make being disorganized an advantage? Sometimes the simple products turn out to offer the most benefits. When you first look at the Cosmetic Express it really doesn’t seem to be much of a product. Yet when you take a closer look at how this unique makeup carrier can allow you easy access to your makeup and still remain contained when not it use, it makes a lot of sense. The Company claims that the Cosmetic Express is really a 4 in 1 product. It is a makeup bag,clean working surface,tidies up quickly, and transforms into a clutch that can be easily carried in your purse. They claim it can easily hold all makeup items including the makeup brushes.They state that it securely closes up so nothing falls out. They also state that it has a zipper up section where you can store your jewelry items. The marketers for this product have done an excellent job at addressing all the big issues that a woman faces when it comes to accessing their many makeup items. Usually there are multiple makeup items that end up in the bottom of the purse that can take several minutes to retrieve. Then there is the inconvenience of finding space to lay all these items out on when they are about to be used. There is also the hassle of makeup becoming damaged in the purse and creating a real mess. These are just the major issues that makeup users are faced with. All of the hype for the Cosmetic Express addresses each of these and creates an interest almost immediately with the makeup user. You can expect to pay about $24. for this item which includes the shipping price, plus one extra Cosmetic Express bag free but the shipping cost for this one is included in the $24. It has a 100%, 30 day money back guarantee, less the shipping and handling. The only effort on your part will be to gather up all of your usable makeup items that are probably scattered about in your purse and home. Once you have done this you just need to put them in your new product and you are good to go. This really is a simple product but has a great concept. Sure there are tons of makeup organizers on the market. In fact, we talk about the Cosmetic Caddie awhile back. It is great for organizing your makeup items, but most women will tell you when they are actually using these types of products they are anything but organized. This is what makes the Cosmetic Express so unique. 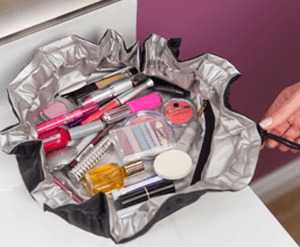 You don’t have to be organized.You can have all of your makeup spread out on the counter but it is going to stay contained on this makeup mat, so when you are ready to put it away you just pull the draw string on the bag and its done. No more grabbing a handful of items at a time and tossing them into your purse. Once the bag is closed up it just pops into your purse and all of your makeup is contained in one area ready for the next use. We are definitely going to give this product a thumbs up rating. It is an easy solution to all the makeup issues that many women face. It keeps all the makeup protected and contained in one area. It is easy to carry all your items along and access them easily when you need them. They can all be spread out so you can see what you have or need yet you aren’t spending a ton of time putting them all back in your purse again after use. It doesn’t get much easier than this. You probably have tried to find some type of solution to keeping your makeup organized in your purse. Perhaps you have used products like the Ladybug Cosmetic Bag which is really cute and helps you to contain your makeup in a smaller area. The problem is though you still end up dumping all the makeup out on the counter so you can see what you have an easily access it. So this product only solves a few of the makeup challenges. What do you think? Does the Cosmetic Express work or not? $7.99 shipping for a 5 oz. bar of soap, ridiculous! Cheaper at Belk Dept. store, now I have to pay to return also,😤never will I buy again from Cosmetic Express!